Using outside contractors to deliver activities may not suit all venues. The alternative, to run the activities in-house can also be a difficult decision. Drawing on our extensive experience we have put together a suite of training courses and familiarisation sessions designed to develop the skills of your existing staff and allow you to deliver target sport activities in a safe and controlled manor. We are also on hand to advise on equipment purchases, range siting and layout and all aspects of venue design for target sports. We work closely with Strong Roots Training to deliver a range of accredited first aid training courses, specifically aimed at the corporate events and activity sector. The standard course for “taster” sessions in air rifle shooting is the NSRA Youth Proficiency Scheme Tutor’s Diploma. 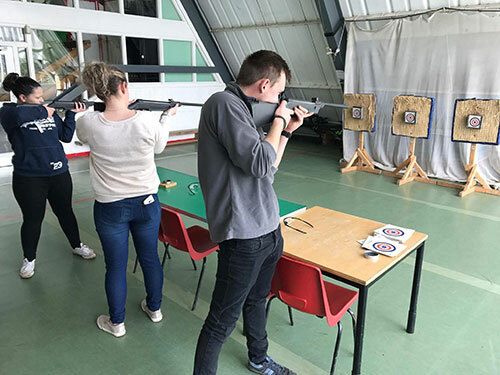 This equips candidates to run have-a-go sessions in air rifle shooting and also to take young people for introduction to shooting over a longer period (as in Scouts or other uniformed groups). It is the standard qualification used by members of the British Activity Holiday Association (BAHA) and written into Scout POR’s (operating procedures). Despite no formal combat archery qualification existing, we draw upon our extensive working knowledge of the game and its safety procedures to deliver a 1-day introduction to the sport. The Archery GB Instructor Award is an entry-level training course and is delivered over 2.5 days. This course is specifically designed for people working in leisure, recreation and educational environments, now and in the future. The new course is focussed on training learners to deliver fun and safe introductory archery sessions. It includes a modernised learning programme and resources, and will be delivered by accredited Archery GB tutors. Though no formal qualifications exist for axe and knife throwing, we are trained members of KATTA, the UK Knife, Axe and Tomahawk Throwing association, and under their guidance we are able to supply instructor training for new or novice axe throwing instructors.